Saving money on your household energy bill, year after year, as explained in the video Home Comfort Pays for Itself, is a compelling reason to invest in a home energy upgrade. But what if you’re not sure you’ll be in your home long enough to reap the reward? After all, plans (and jobs) change, especially in this day and age. Payback periods – the length of time it takes to recoup your initial investment — can range from 4 to 10 years, depending on which improvements you make, the size of your house, and where you live. According to a groundbreaking study, “The Value of Green Labels in the California Housing Market,” it doesn’t matter how long you plan to remain in your home. Adding insulation, air sealing, water conservation, the use of durable, low-maintenance, low-VOC or zero-VOC building materials and finishes, effective exhaust systems, and efficient ventilation, can all add surprising value to your home. 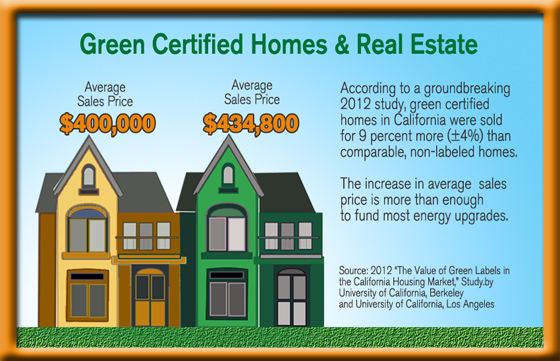 The 2012 study by economists at the University of California, Berkeley and University of California, Los Angeles, analyzed 1.6 million homes sold in California between 2007 and 2012 and found that homes labeled by Energy Star (including its HERS program), LEED for Homes (Leadership in Energy and Environmental Design), or GreenPoint Rated (a California-only labeling program) sold for 9 percent more (±4%) than comparable, non-labeled homes. The study controlled for key variables that influence home prices, including location, size, age, swimming pools, views, and air conditioning. 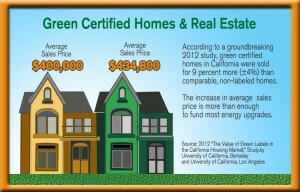 Given the $400,000 average sales price of a non-labeled home, the premium for a certified green home is $34,800 – more than enough to fund most energy upgrades. In areas where climates were more extreme (in the case of Southern California, very hot), researchers found that green-labeled homes generated an even higher premium. They speculated that where cooling costs and electrical rates were high, greater savings could be realized, making green-labeled homes more valuable. Not all the value placed upon green-labels had to do with saving money. Areas with high registrations of hybrid cars also placed higher values on green-certified homes. While the study underscores the value of a green-home certifications, either from a national or local entity, such labels often come with a hefty price tag and a lot of paperwork. In addition, most labeling programs focus on new home construction or upon “gut,” whole-house remodeling – not upon the vast majority of existing homes. There are, however, some inexpensive, common sense ways home sellers and their agents can make the case that a green home is green and therefore worth more. One way is to include green features on the listings. The National Association of Realtors is encouraging local MLS boards and committees to incorporate green features on listing forms and dozens have done so. The MLS for Colorado Real Estate Network includes sections for green certification (including scores) and green remarks. North Carolina’s Triangle MLS’s form lists two dozen green building features, such as fresh air ventilation systems, spray foam insulation and xeriscaping, as well as national, state and local green certifications. If your home has green credentials, make sure home buyers are aware of them. Provide a bulleted list of features that agents can use as talking points or that can be left at open houses with other handouts. R-values of roofs, walls, basement, crawlspaces, etc. Warranty from energy conservation contractors, including insulation, crawlspace encapsulation, cool-roof roofing, etc.